Clever, Tate Liverpool. People have heard of Francis Bacon, so put the news that you’re hosting an exhibition of his works out there for the world to hear. 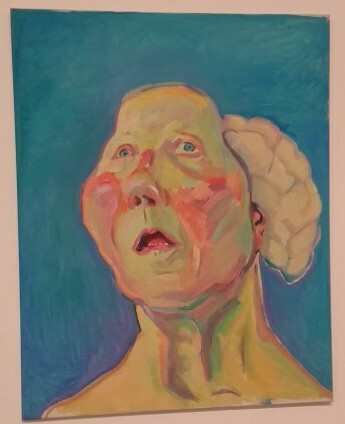 Also featuring Maria Lassnig, apparently. This isn’t the first time they’ve attached an exhibition of an artist I’ve not heard of to one that we all have – the Andy Warhol/ Gretchen Bender collaboration a couple of years ago was a similar idea. But in that one you came to the less famous artist’s work last, making it feel like a side-note. This time they’ve reversed that approach and I think most people will be surprised when they walk into the exhibition to find that Maria Lassnig is the initial attraction. They should be congratulated on doing this and making her more than just a “tag-on” to the more famous name, because her art is wonderful. The literature which comes with your ticket says that Lassnig worked with a theory called ‘body-sensation’ or ‘body-awareness’. This was the idea that the body is not what is perceived visually, but experienced internally. 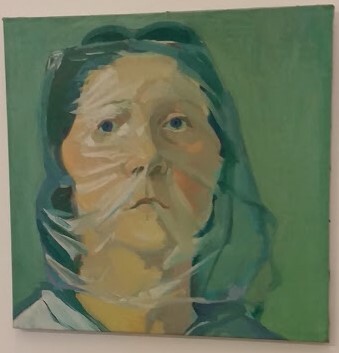 One thing that I strongly felt through this exhibition was that Lassnig is providing an opinion on this subject that is not often heard – the opinion of a woman. Only a couple of weeks ago I was with a friend who was complaining about the lack of female voices in the history of art, which means that the divide between the many expectations of women (beautiful, traditionally subservient, likes to seem independent but still ultimately under the control of men) and our internal feelings (as diverse as people are in the world) is little explored. A couple of paintings really stuck out as making this point, such as Kitchen Bride in which the artist has become, I’m sure in more ways than one, a very reluctant piece of kitchen equipment. I particularly loved Self-Portrait Under Plastic. Apparently in New York, Lassnig was interested in how fruit came protected in plastic to stop it rotting. So this may be what she’s doing – preserving herself as she is, in her early 50s, not ruining herself. But we know that if you really tried this you would suffocate, which is much less appealing. But, consciously or subconsciously, that’s the way social pressure works. You have to be a strong person not to get smothered by expectations. But I didn’t come out of this exhibition thinking of Lassnig as a purely “feminist artist” – she explores many aspects of life which are universally relevant. I found the paintings in the ‘Science Fiction’ section, where she explores her relationship with technology, particularly uncomfortable. In Lady with Brain her thinking has been delegated to an external attachment – 26 years later, smartphones are ubiquitous. It can’t help but feel remarkably relevant. She also uses ‘body-awareness’ to explore her old age in painful detail – for we all know older people whose brains and emotions are stunted by their physical deterioration. The paintings are arranged thematically rather than chronologically, and Lassnig clearly experimented with several styles over her long career. Whether more or less abstract, though, her art beautifully explores the human condition and negotiates the everyday fact that what you expect of a person isn’t necessarily how they feel about themselves. I am glad that the Tate curators had heard of her and have seen the value in making her voice heard. They’ve made at least one new fan. This entry was posted in Exhibitions, Home, Past exhibitions and tagged art, culture, human, Lassnig, Liverpool, Tate, woman artist. Bookmark the permalink.